Last month we heard from a tutor who has been working with a group of Health Issues in the Community (HIIC) students over the last year who have used the course to explore issues around self-harm and suicide. The HIIC group who meet at Douglas Community Centre, have been working through the accredited course over the last year. The course aims to develop students understanding of the range of factors that affect their health and the health of their communities. The course introduces concepts around the Social Model of Health. It pulls on people’s experiential learning and explores how issues around poverty, inequality and social justice can be addressed collectively using community development approaches. This piece of drama centres on a 17-year-old daughter of a working lone parent. Her mum works two jobs to buy her daughter all the nice things she wants, meaning Sophie rarely sees her. After becoming depressed, Sophie begins to self-harm. 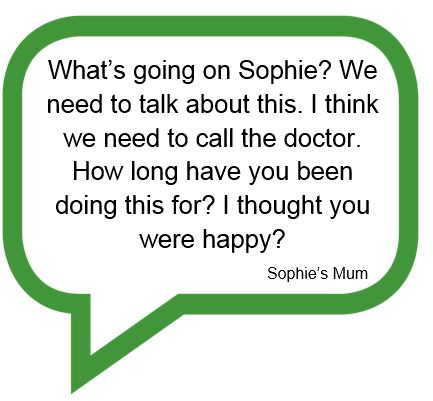 Her mum, devastated to find out how Sophie is feeling, takes her to the doctors who prescribes anti-depressants and gives her information about support websites and helplines. “your call is important to us and will be answered shortly”. Sophie dies waiting. This powerful piece of drama, written and performed by the group, has been highlighted locally as a fantastic piece of community learning, with the group using the skills and experiences to demonstrate how health encompasses a range of different factors. The group developed the play from a place of lived experience, having in their families dealt with issues around mental ill health, self harm and addiction. The play was first delivered to an invited audience last year and was very well received. The members have since delivered the play with then Health Secretary Shona Robison; at the Wevolution yearly gathering in Glasgow and at a meeting of the Mental Health Strategic Planning Group meeting. Each performance being followed by a full and frank discussion. All of whom, have been so moved, are determined to work collectively to involve the women to offer peer support to people experiencing poor mental health. The group have gained so much through doing this, their confidence has soared, and they feel empowered that they have the knowledge to answer questions from the audience due to extensive research. They have gone on to volunteer with Healthy Minds, a drop-in service being developed locally, offering mentoring to people who are going through mental trauma. They have also formed a self-reliant craft group to generate some income and help their own mental wellbeing. “As a group, we find it hard to believe the impact we are having locally with our drama, with volunteering and with our learning. We have had a government minister come to watch us, she took part in the lively debate that followed our play and pledged to do something about the terrible loss of young lives in Dundee particularly, but in Scotland as a whole. It’s crazy to think we can make a difference but that is what is happening. Having successfully completed Part 1 of HIIC, the group are now moving on to part 2. You can find out more about the group by contacting, Elaine Sword (CLD, Community Health Worker, Community Health Team, Dundee) on elaine.sword@dundeecity.gov.uk or 01382 438589 or Teresa Fulton (CLD Adult Education Worker) on teresa.fulton@dundeecity.gov.uk or 01382 436920. And find out more about HIIC here.